I have been making weekly visits to Trader Joe's. My last visit I picked up Steel Cut Oats to try. They are suppose to be healthier for you. One thing about this type of oats is that it takes longer to cook. 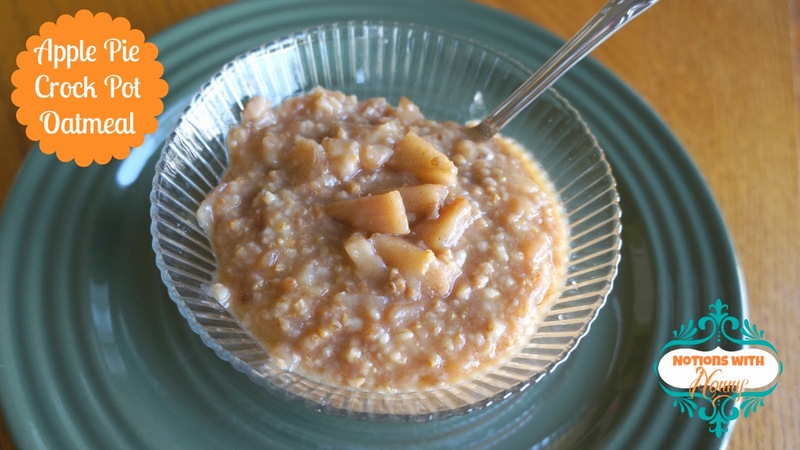 So when I saw this recipe for Crock Pot Apple Pie Oatmeal, I knew I wanted to try it. For Best Results: Combine all ingredients in slow cooker and cook for 2-4 hours on high or 4-6 hours on low until it reaches the consistency that you like. Be sure to stir every hour or so. * You can also cook longer without stirring, but you have to add more water liquid and it does come out a bit mushier. Add an extra cup of liquid for 7-8 hours in the slow cooker. I put my crock pot on the night before so that it would be ready in the morning. I was very pleased with how it tasted. I added butter and milk and it was just perfect! Below is a stove top method and it tastes similar, but I still prefer the slow cooker version better (the oats become softer the longer they cook). Combine all ingredients in a saucepan and bring to a boil. Simmer for about 30 minutes, or until it reaches the consistency that you like. It sounds delicious to me. I haven't tried Steel Cut Oats, but I'll be keeping my eyes open to try and come across them. Thanks for the slow cooker recipe share.